Twenty years ago it was inconceivable that an out-of-state or international skier or snowboarder would buy a season pass to Vail or Beaver Creek or one of Vail Resorts’ other Colorado ski areas. Now I regularly ride the chairlifts at Vail and Beaver Creek with snow riders from all over the world who bought the 11-mountain (soon to be 12) unlimited (no black-out dates) Epic Pass just for one or two ski trips to Colorado per season. 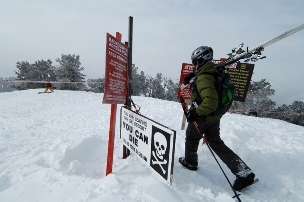 A “You Can Die” warning sign at Vail’s Canyons Resort in Utah (Dan Davis photo). This season alone I rode lifts with snow riders from Japan, Australia, Germany, Great Britain and virtually every corner of Latin America. Now comes word that Vail has purchased its first international resort — the largest ski complex in Australia called Perisher. So that brings the total number of ski areas on the Epic Pass to 12. Here’s the current list: Vail, Beaver Creek, Arapahoe Basin, Keystone and Breckenridge in Colorado; Afton Alps in Minnesota; Mount Brighton in Michigan; Heavenly, Kirkwood and Northstar in California; and Park City and the Canyons in Utah. Vail now owns the largest ski areas in three states (Vail in Colorado, Canyons in Utah and Heavenly in California) and one country (Perisher in Australia). And they’re getting even bigger. This Perisher news comes on the heels of Vail’s successful approval process for its interconnect gondola between its new Park City Mountain Resort and the adjacent Canyons ski area in Utah. On schedule to be built this summer, the new gondola will make the Park City complex the largest ski area in the United States at more than 7,300 acres. Vail has yet to announce its international partnerships for the 2015-16 ski season, but this season the Epic Pass included five days at Verbier, Switzerland, five days at Les 3 Vallees in France, and five days at Niseko, Japan. Big deal, you may say, if you’re a local skier just looking to hit your local hill as much as possible. But this actually is a big deal if you consider that I met skiers from Japan’s north island here last season. They were very happy with the snow in Vail in late February but told me Niseko gets nearly 600 inches a season — inland powder, not coastal concrete. They begged me to tell them where the run “You Can Die” is, and I finally figured out they meant the new warning verbiage on Vail’s back-country gates. They told me I had to get to Japan, and I may make that happen some day. I know a group of Vail skiers who did make the trip, and they had glowing reports. Plus, I met an Australian Epic Pass-holder who says he typically skis Niseko (a much closer flight) but decided to buy the pass for the five days in Japan and then use it to check out Colorado. He liked what he found here, although he did not ask me about the “You Can Die” signs. Most incredibly well-traveled and thrill-seeking ozzies I’ve met over the years would love such a sign, although I assume at Vail’s new resort Down Under it would have to read “You Can Perish”. There are also huge implication for year-round skiing since the Perisher deal gives Vail a ski area that’s now open for snow riding during our summer months. There must be resort workers seriously considering the non-seasonal employment opportunities. BROOMFIELD, Colo.—March 30, 2015—Vail Resorts, Inc. (NYSE: MTN) today announced that the Company has agreed to acquire its first international mountain resort, Perisher Ski Resort (“Perisher”) in New South Wales, Australia, for total cash consideration of AU$176.6 million (approximately US$136 million), subject to certain adjustments. Perisher is the largest and most visited ski resort in Australia, and is well-positioned with access to the country’s largest cities, including Sydney, Melbourne, Adelaide, Canberra and Brisbane. Perisher is also the largest ski resort in the Southern Hemisphere. The acquisition is expected to close in the fourth quarter of fiscal 2015 following the satisfaction of certain conditions, including approval by the New South Wales Government under the long-term lease and license noted below. The Company is purchasing 100 percent of the stock in the entities that operate Perisher from Murray Publishers Pty Ltd and Transfield Corporate Pty Ltd in Sydney. Perisher holds a long-term lease and license with the New South Wales Government under the National Parks and Wildlife Act, which expires in 2048 with a 20-year renewal option. The acquisition includes the resort areas known as Perisher Valley, Smiggin Holes, Blue Cow and Guthega, along with ski school, lodging, food and beverage, retail/rental and transportation operations, which together comprise Perisher. Vail Resorts also announced that as of today, Perisher has re-opened season pass sales for its upcoming ski season, which is set to open on June 6, 2015. Perisher’s popular “Freedom Pass” is on sale for AU$749 and will include benefits substantially similar to Vail Resorts’ Epic Local Pass, with unlimited skiing and riding at Breckenridge, Keystone and Arapahoe Basin in Colorado; Park City and Canyons in Utah; and Heavenly, Northstar and Kirkwood in the Lake Tahoe area of California and Nevada. It also will include 10 days of free skiing and riding at Vail and Beaver Creek in Colorado. All U.S. resort access will be subject to certain holiday restrictions. Upon closing the acquisition, all previous purchasers of the 2015 Perisher Freedom Pass will also receive these new benefits and all Epic Pass purchasers will receive unlimited and unrestricted skiing at Perisher. The Company indicated that it expects Perisher to generate incremental Resort Reported EBITDA of approximately AU$20 million (approximately US$16 million) during its first twelve months of operation following the acquisition. The Company expects Perisher to generate positive Resort Reported EBITDA of approximately AU$38 million (approximately US$30 million) during its ski season, June through September, and negative Resort Reported EBITDA of approximately AU$18 million (approximately US$14 million) during its off-season, October through May. Further, the Company expects Perisher to generate approximately US$6 million of free cash flow in its first year of operations, after deducting capital expenditures at the resort, income taxes (both U.S. and Australian) and all interest expense relating to the acquisition. These estimates do not include any incremental benefit of increased visitation to the Company’s U.S. resorts from Australian guests. At closing, the Company intends to fund the purchase price with cash on hand and the revolver portion of its senior credit facility. Depending upon timing of the closing, the Company will pay the sellers or receive from the sellers the net cash flow of Perisher since January 25, 2015. In addition, the Agreement provides that the Company will pay New South Wales stamp duty related to the acquisition, estimated to be approximately AU$4 million (US$3 million). References to U.S. dollars are based upon currency exchange rates currently in effect.